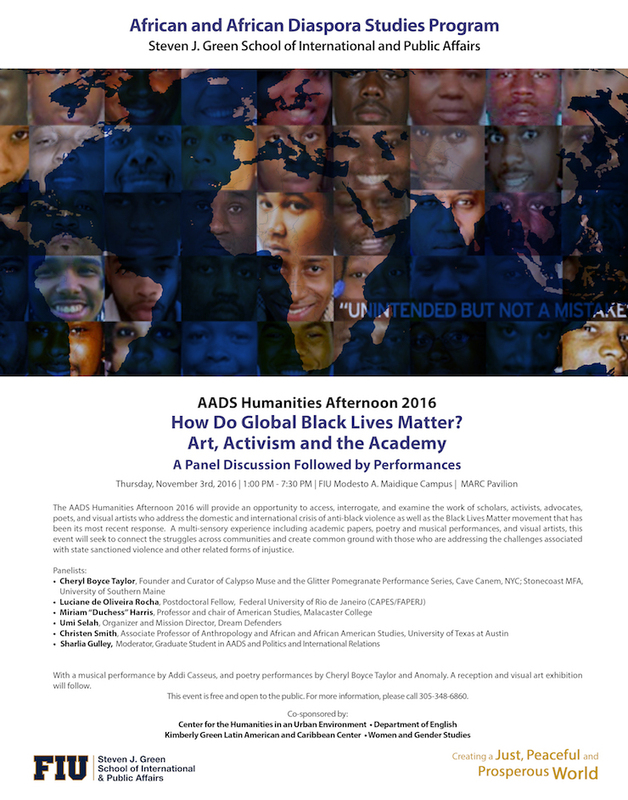 Please scroll down to view the program for this Humanities afternoon. Christen Smith is Associate Professor of Anthropology and African and African Diaspora Studies at The University of Texas at Austin. Her research focuses on engendered anti-Black state violence and Black resistance in the Americas, particularly police violence and the transnational Black movement to end it. Dr. Smith’s work in Brazil uses the lens of performance to examine the immediate and long-term impact of state violence on Black people and anti-violence organizing. Her book, Afro-Paradise: Blackness, Violence and Performance in Brazil (University of Illinois Press, 2016) explores the visual and performatic economies of the Black body in pain as an ironic transfer point for the production of Brazil’s racial state. Her more recent comparative work examines the lingering, deadly impact of police violence on black women in Brazil and the U.S.
Cheryl Boyce-Taylor is a poet and workshop facilitator. The recipient of the 2015 Barnes and Noble Writers For Writers Award, she is the founder and curator of Calypso Muse and the Glitter Pomegranate Performance Series. Cheryl earned an MFA in Poetry from Stonecoast: The University of Southern Maine, and an MSW from Fordham University. She is the author of three collections of poetry: Raw Air, Night When Moon Follows, and Convincing the Body. A poetry judge for The New York Foundation for the Arts, and The Astraea Foundation, she has facilitated poetry workshops for The New York Public Library, Poets & Writers, Poets House, and The Caribbean Literary and Cultural Center. Her poetry has been commissioned by Jacob's Pillow, The Joyce Theater, and the National Endowment for the Arts for Ronald K. Brown: Evidence A Dance Company. A VONA fellow, her work has been published in CURA:A Literary Magazine of Arts & Action, Callaloo, Aloud: Voices from the Nuyorican Poets Cafe, Pluck!, Killings Journal of Arts & Letters, Adrienne, and Prairie Schooner. Her fourth book Arrival, is forthcoming from Northwestern University Press in the Spring of 2017. Luciane O. Rocha is a Postdoctoral fellow at the Federal University of Rio de Janeiro (CAPES/FAPERJ). She has a PhD in Sociocultural Anthropology with a focus on African Diaspora Studies and Women’s and Gender Studies from the University of Texas at Austin. Her dissertation Outraged Mothering: Black Women, Racial Violence and the Power of Emotins in Rio de Janeiro’ African Diaspora focused on Black mothers’ activism against urban violence. Her current work examines the system of criminal justice flow in cases of homicides. She is specially interested in the partnership of families of victims of violence with public defenders to the celerity of the processes. Duchess Harris is the Chair of the American Studies Department at Macalester College. She is the author of four books. She co-authored Hidden Human Computers: The Black Women of NASA, and Black Lives Matter with Sue Bradford Edwards, (Essential Library), authored Black Feminist Politics from Kennedy to Clinton/Obama (Palgrave Macmillan), and published an edited volume with Bruce Baum, Racially Writing the Republic: Racists, Race Rebels, and Transformations of American Identity (Duke University Press). "Anomaly" is a Writer, Poet, Spoken Word Artist, Event Host, and occasionally DJ are a few of the titles that have come to be associated with Tracy Sumpter, more affectionately known as “Anomaly” around the South Florida Arts scene for the last 10 years. A Budget Analyst by day and artist by night, Anomaly's rise an artist started on the stages of the Bohemia Room and the Literary Café. Anomaly captivates audiences by creatively stringing words together in ways that make it apparent that she a student of her craft, lover of words, and wise beyond her years. As an even host, her colorful personality, quick wit, and affinity for music allow her to easily make a room full of complete strangers feel like a family reunion. She currently host Flow Friday’s, a weekly poetry and music open mic at Piano Hollywood inside the Hard Rock.